The View: Terry Crews or Rosanne Barr as Next Co-Host? 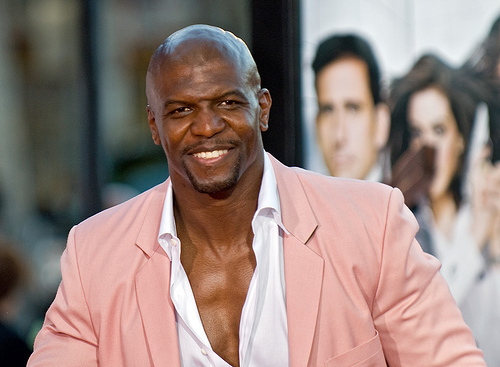 Brooklyn-Nine Actor and Funny man Terry Crews came back on “The View” today as a guest host. His first apperance as guest host was a few weeks ago when Barbara Walters retired. He was recently named as the new host of the popular TV show “Who wants to be a millionaire.” I know the 13th season of Who Wants to be a Millionire will start shooting this fall Crews from Stamford, Conneticut, but I was just thinking, it would be nice to see him on The View Daily. Out of all the guest hosts that have come on the show, I have enjoyed both him and Veteran Actress Rosanne Bar. I am not sure how possible it would be to do The View, a daily show that shoots in New York and then maybe head on down to Stamford to shoot Who Wants to be a Millionaire, but if it is possible, it would be awesome to see him on board. Let’s assume there is a conflict in schedule and Crews absolutely could not co-host The View, from what I have seen from the Guest Hosts, Rosanne Bar would be the next best option. She is funny, opinionated and a lot more refreshing than watching Sherri Shephard tell us what she thinks we want to hear. The View needs an honest Co-Host to balance things. Not everyone is interested in politically correct answers.